Formic acid and methanol are considered as liquid organic hydrogen carriers and could be produced sustainably from biomass or by CO2 hydrogenation using catalysts. The choice of a catalyst for decomposition of these substances is a challenge. We prepared N-free and N-doped mesoporous carbon materials containing less than 2 wt% of gold not stabilized by chlorine anions. High-angle annular dark field scanning transmission electron microscopy (STEM) data showed that the supported gold was present in the state of single Au atoms and Au nanoparticles after reduction. The use of the N-doped carbon support allowed reaching high dispersion of the Au nanoparticles with a mean size of ~ 2 nm, as compared to ~ 10 nm for the N-free support. Density functional theory studies indicated that a single Au atom may attach strongly (> 3.6 eV) to carbon atoms on the graphene edge or even more strongly to carbon atoms in a double vacancy; however, it may attach only weakly to N species of the N-doped carbon. Formic acid and methanol molecules interact relatively strongly (~ 0.75 eV and ~ 1.0 eV, respectively) via their oxygen atoms with the Au atom on the graphene edge, while they interact only weakly with the graphene fragments containing the Au atoms in double vacancies (~ 0.4 eV and ~ 0.3 eV, respectively). This demonstrates importance of coordinative unsaturation of Au atoms for adsorption and may influence further reactivity of the adsorbed species. 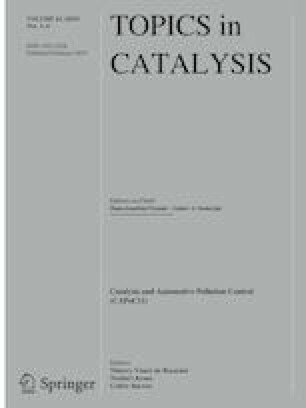 The obtained results can be used for development of catalysts and electrocatalysts containing single Au atoms for hydrogen production from liquid organic hydrogen carriers. The online version of this article ( https://doi.org/10.1007/s11244-019-01166-1) contains supplementary material, which is available to authorized users. This publication was conducted with the financial support of the Russian Science Foundation (Grant 16-13-00016).